City Centre Health Edmonton Chiropractic (previously founded as Edmonton Chiropractic) is one of the original chiropractic clinics in Edmonton. It has since changed hands over the last 5 decades and was taken over by Dr. Niz Saab in 2014. We are conveniently located in the downtown core of Edmonton, across from City Hall. We have street parking available on 103 Avenue, as well as above ground and underground parking all around our building (The Churchill Building). If you work downtown, it’s an easy stop during your workday for a visit! 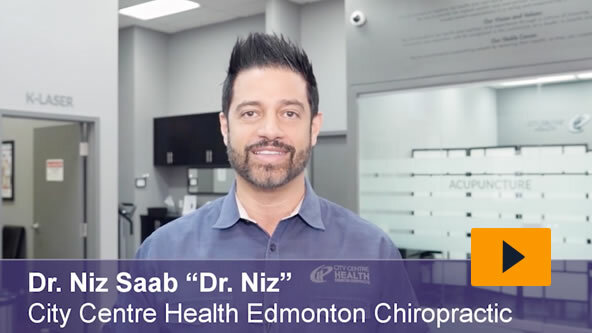 It is the mission of City Centre Health Edmonton Chiropractic to empower people by restoring their health so they can create the life they want. To provide excellence in our care and service, achieve optimal results and exceed patient expectations in the most caring and empowering environment. We will transform the health and wellness care experience through a culture of listening, great service, integrity and innovation, and be recognized in the community as leaders in health and wellness education and restoration. Our modern, vibrant health care facility provides chiropractic care with a focus on posture restoration/retraining. Many of our patients seek out Dr. Niz’s expertise, which he has used to create programs for peripheral neuropathy (diabetic neuropathy), herniated bulging discs, disc degenerative disease, sciatica, and any acute or chronic injuries using K-Laser Cube 4 technology, which can help your body heal very quickly. Chiropractors are trained to ensure that your nervous system is free from spinal nerve interference. You may be experiencing pain, or you may simply see us to check that your health is at an optimal level. Whether you seek crisis management or wellness care, we have many tools to stabilize your health, then correct any underlying causes. Use your insurance coverage to direct bill for your visit. Contact us today to find out what we may be able to do to improve the way you live!